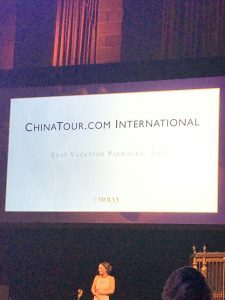 Last month, China Tour was proud to accept the silver medal at the 2019 Travvy Awards held at Gotham Hall in New York City presented by travAlliancemedia in the Best Vacation Packager-Asia category. CEO Alex Wang was on hand at the gala event, known as the “Oscars of the travel industry,” to accept the award on behalf of China Tour. For more than 10 years travAlliancemedia has been on the forefront of media related to the travel industry, serving as an irreplaceable promoter of the travel agent business. TravAlliancemedia handed out nearly 300 awards to recognize the very best travel companies in dozens of travel categories such as destinations, hotels and resorts, and tour operators. Significantly, the Travvy Awards are the only ones in the travel industry which are voted on by travel agents themselves, those with the inside knowledge regarding every category and business that is nominated. Over 130,000 votes were cast this year alone. As a relative unknown only a few years ago, we at China Tour are extremely proud to have even been nominated for the award in Best Vacation Packager-Asia. We put all of our collective energy into booking tours that meet our clients’ needs to the letter. We hope this award will lead to more travel-addicts entrusting us with booking and handling their next adventure abroad. For more on the 2019 Travvy Awards, including the list of winners from each category, visit the Travel Pulse website. To read about all the tour packages offered by China Tour, check out our website, or reach out to our skilled travel agents.